Healthy smiles are our main goal here at Smiles Are Us, and like most other self-care regimens, optimum results are achieved through consistency. Our team is dedicated to routine, compassionate care that leaves you feeling more confident than before you walked in our doors. As a neglected mouth can result in several other health consequences, it is important to be seen on a regular basis. When neglected, calcified plaque and tartar build-up can cause periodontal (gum) disease, which often results in tooth and bone loss. You can count on Smiles Are Us to help you with preventative care leaving you with a smile you are proud to wear. During these visits, your teeth will be assessed and thoroughly cleaned by our leading dentists. Your cleaning will focus on gently eliminating calcified plaque and tartar build-up that has collected along the teeth and gums. Consistent action will reverse symptoms of gingivitis, decrease your risk of future cavities, and preserve your natural teeth for years to come. 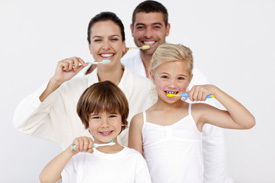 A happy smile does not only happen inside the dentist office, but it also takes place in the comfort of your own home. A steadfast home care regimen is crucial to keeping your teeth and gums as healthy as possible. For this reason, Smiles Are Us suggests at least two minutes of brushing per day as well as daily close flossing to clean the hard-to-reach areas between the teeth and below the gumlines. No matter your dedication to at-home dental care, build-up is inevitable. If left unaddressed, you may begin to experience symptoms of gingivitis such as swollen or tender gums, bleeding while brushing or flossing, and food constantly catching in the spaces separating your teeth. To ensure healthy teeth, make sure to do your part! Smiles Are Us believes a happy mouth is a happy life. With your home care routine and our cleaning expertise, your smile will shine for a lifetime.